We love ice cream here. Since I don’t do well with lactose, I make all of our ice cream with coconut cream or coconut milk. This chocolate mint coconut ice cream is a big favorite at our house. 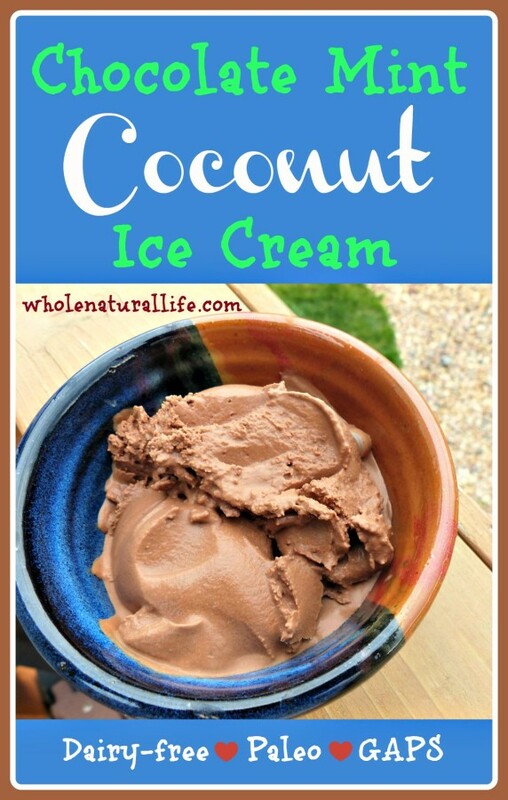 Even if you don’t have any issues with dairy, making coconut milk/cream ice cream is an easy and delicious way to get more coconut oil into your diet. I don’t think the coconut flavor is very noticeable in this recipe, but as I’ve said many times, my coconut tastes are pretty dulled from all of the coconut products we eat here, so your opinion may differ. Blend all ingredients in your blender or mix by hand with a whisk. Process in your ice cream maker until desired texture is reached. Serve immediately or chill in your freezer for a few hours to firm up, preferably in a shallow container to simplify future defrosting. This ice cream will last indefinitely in your freezer, although it will become very hard after it’s been in the freezer for more than a few hours. Give it at least twenty minutes or more to defrost before you plan on eating it. I am going to have try this out really soon! I've enjoyed making chocolate ice cream, but I love anything with mint. Yum! Looks delicious! Thanks for sharing at Scratch Cookin' Tuesday! I am a huge fan of anything chocolate and mint...can't wait to try this!